This girl recreated an iconic Kylie Jenner look for prom | HELLO! June 06, 2016 - 14:49 BST hellomagazine.com She looks amazing! Remember Kris Jenner's Great Gatsby themed birthday party last year? The Kardashian/Jenner momager pulled out all the stops for her 60th celebrations, and the whole family turned out in dazzling outfits with diamonds for days. But, of course, the stand-out look from the event came from the youngest member of the famous clan: Kylie, 18, looked incredible in a floor-length bedazzled number, setting the bar impossibly high for any future 1920s events ever again. For most people, anyway. One girl decided to recreate the look for her prom and totally nailed it. Dailyn Crumble looked to Kylie for inspiration and had an imitation dress custom made. Speaking to Seventeen.com, she explained: "The rhinestone chains were cut out piece by piece and hand sewn onto the dress. My intention was to recreate [Kylie's] dress. I thought her dress was great. I'm also a fan of Kylie [and] her style is amazing." 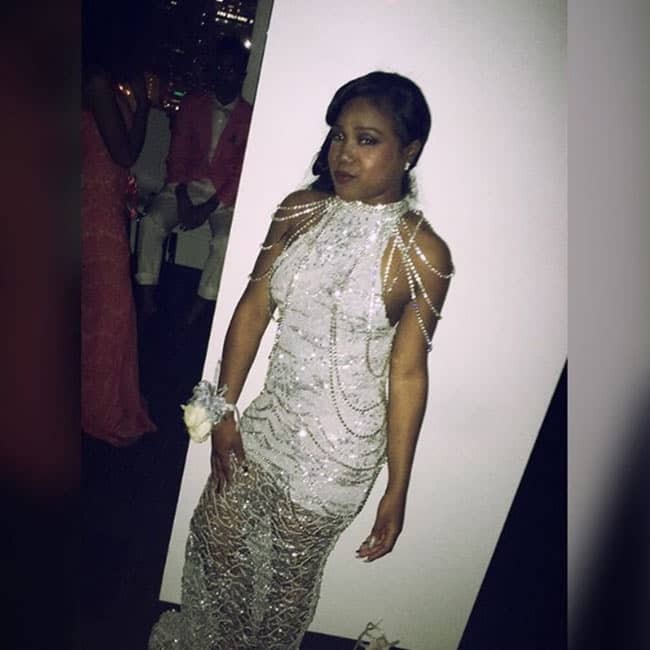 It seems imitating Hollywood stars for prom is becoming a trend in the US, after 18-year-old India Ross, from St Louis in Missouri, copied Beyoncé's 2014 Met Gala look for her high school celebrations. She told Buzzfeed News: "My date and I felt like Beyoncé and Jay Z. It wasn't prom, it felt like we were at the Grammys, everyone slayed." All we're left wondering is: why didn't we have the sense to use a celebrity as inspiration for our own proms, instead of paying tribute to My Big Fat Gypsy Wedding? What do you think of the look? Let us know in the comments box below.